Star Wars 9 Leak Reveals Shocking Traitor in Revenge of the Sith-Type Twist? All has been quiet on the Star Wars 9 front as we enter the eighth week of shooting on the upcoming trilogy ending sequel. But today we have some jaw-dropping news. There is a traitor in the midst, and it will shock and upset fans, who aren't going to see it coming. Not by a long shot. Okay, so this is a rumor from a supposed leak, and won't be confirmed by Disney or Lucasfilm until after the movie is in theaters. Also, this is a HUGE spoiler, so stop right there in your Bantha tracks if you don't want to know what could be one of Star Wars 9's biggest secrets. Are we all good? Can we move forward now without the worry of crybabies ruining it for everyone else? Ok, cool. So, what is this major shock twist that will reverberate throughout the canon? 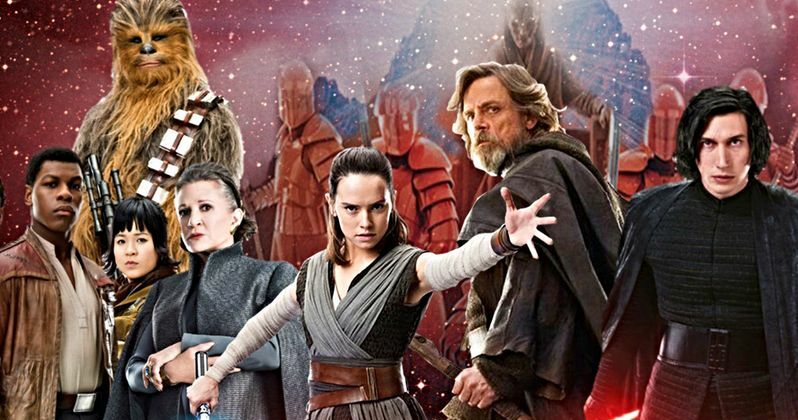 It comes on like an homage to Revenge of the Sith, once again proving just how much director J.J. Abrams wants to incorporate the prequel trilogy into this project, which brings the 9 film Skywalker saga to a close. Though, there have been rumors that this sequel will be split in two, making it ten films total. If there's one thing that stands on the surface of every Star Wars film, it's that themes and storylines are repeated and echoed Ad nauseam. The Force Awakens was almost an exact Clone of A New Hope with some original flourishes added here and there. While it would be easy to call Star Wars 9 a Return of the Jedi remake, that's actually not going to be the case. Instead, it will directly tie into and echo the sum majority of Revenge of the Sith. J.J. Abrams isn't going full on rip-off, though. He is putting a fresh spin on the classic hidden character trope. There is a traitor that will be exposed. This character is someone who has already been shown as having an appetite for hatred and revenge. The rumor claims this. "Kylo Ren is suspicious of an individual in the First Order handing out information to the Resistance. Part of the Episode 9 storyline will have a cat and mouse element to it, similar to Revenge of the Sith where the Jedi were trying to find out who the Sith lord is, which turned out to be Palpatine." Before now, the Star Wars traitor has been a bad guy posing as good. This time, we get the reverse of that. In what is being called a 'delicious' twist, it's one of the villains that will be exposed as working for the good of the galaxy. And it's the First Order who will be betrayed. Palpatine was always hiding in plain sight. The same will happen here, with one of the villains we've come to loath in The Force Awakens and The Last Jedi giving the Resistance secrets and tactical information that will help them take down and destroy the First Order for good. This leak first started to bubble up in May 2018. It claims that General Hux, who is not exactly loved by Star Wars fans, and fails to sell many action figures, is the mole resting within the First Order camp. So why would he betray his organization? That was easily set up in The Last Jedi. Kylo has destroyed Snoke to become Supreme Leader Ren, and Hux can't stand it. He hates Ben Solo, and is so blinded by his disgust, that he aims to take down the former Jedi pupil's whole operation. Hux doesn't want the Resistance to bring the First Order to an end. He is turning traitor to set Kylo up and show the others in his camp what a bad ruler Ren truly is. Hux is so devoted to the First Order, that he somehow justifies his being a traitor as a means to a glorious end. Hux is out to prove that Ren is an unfit leader, hopefully getting himself promoted to Supreme Leader Hux in the process, no matter how devastating that proves to be to his own organization. It's doubtful his motivations and plan to help the Resistance will sell more action figures. This sounds like a mission Hux will eventually screw up, and it could very well backfire big time, relegating him to an Imperial jail cell, with a smelly cell mate named Etinpi Skyvor, where he'll be forced into a love slave relationship with a space creature who creates cloth and stick action figures of Rose Tico only so he can cut them up with his sharp dirty nails, forcing Hux to eat them. Hux will probably get the worst death yet in this franchise if this all plays out according to plan. This latest leak, while not proven true at all, does seem plausible. There have been plenty of leaks since shooting began on Star Wars 9 back at the beginning of August. We don't yet know what is true and what is subterfuge. This latest intel was dumped out of the loading bay that is The Sunday Express. Take it with a pinch of poo-doo.